A seaman was taken to hospital yesterday after his foot was crushed between two vessels. The man, in his 70s, was working onboard the Goliath tug when the accident happened at Macduff Harbour early yesterday. The four-man crew were attaching the tug to a floating fish farm feeder when a swell caused them to bump, trapping the man’s foot. RNLI Macduff were called to assist, and took the injured man – who suffered broken toes – onshore, where an ambulance was waiting to take him to hospital. Last night, one of the man’s colleagues confirmed the details of the incident. He said: “One of the lads working on here crushed his foot. Sean Youngson, a welder with Macduff Shipyards, spotted the emergency services at the quayside. It is understood the vessel was in the north-east to tow the fish feeder out to a fish farm on the west coast. Goliath is owned by Dorset-based marine haulage fire Griffin Towage. 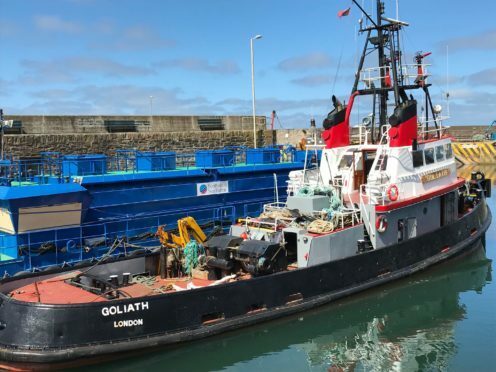 Company director Jon Evelegh said: “One of the crew on the Goliath was connecting some towing equipment to a barge in Macduff Harbour, and a swell caused the tug and barge to contact briefly. “Unfortunately the crew’s foot was in the wrong place at the wrong time in between the tug and barge. “He was wearing personal protective equipment. This included steel tow cap boots, and his steel toe cap is understood to have afforded his foot some protection, otherwise his injuries may have been worse. “The crew was landed ashore and taken to Aberdeen hospital for treatment. An ambulance service spokesman said: “We received a call at 6.40am to attend an incident at Macduff Harbour in Aberdeenshire. Goliath is a twin screen tug and it was built as the MSC Scimitar in 1956 for the Manchester Ship Canal Company. It was purchased by Spithead Trading 1986 and was adapted to bring it up to seagoing standards. Griffin Towage bought it in 2007 and it has been part of their fleet ever since.